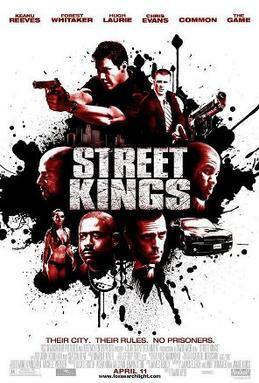 Street Kings (originally titled The Night Watchman) is an upcoming 2008 film. The screenplay is written by notedauthors James Ellroy and John Ridley; the film is directed by David Ayer. The film stars Keanu Reeves, Hugh Laurie andForest Whitaker. The film is scheduled to be released in theaters on April 11, 2008. In 2004, it was announced that Spike Lee would be directing the film for a 2005 release. In 2005, it was announced thatOliver Stone was in talks to direct the film. But Stone later denied this. Training Day writer David Ayer took over the project. So far Hugh Laurie, Chris Evans, Terry Crews, Common, Jay Mohr, The Game, Keanu Reeves, and Naomie Harris have been confirmed roles in the movie. On February 5, 2008, it was announced that Fox Searchlight Pictures changed the film’s title from The Night Watchmanto Street Kings. Tom Ludlow (Keanu Reeves) is a Los Angeles cop who has spent his life never having had to reach across the abyss from his world to the other. Ludlow’s life, however, becomes cheerless, dark and deadly, after the death of his beloved wife. Ludlow is pressed into action when he is framed for the murder of a fellow officer by those close to him. Deeper and more profound themes are interwoven in this story of a man’s struggle for meaning in a world that is increasingly controlled by outside forces. ~ by darkdestroyer on April 8, 2008. Master Yoki Master Chief Al TAhir!